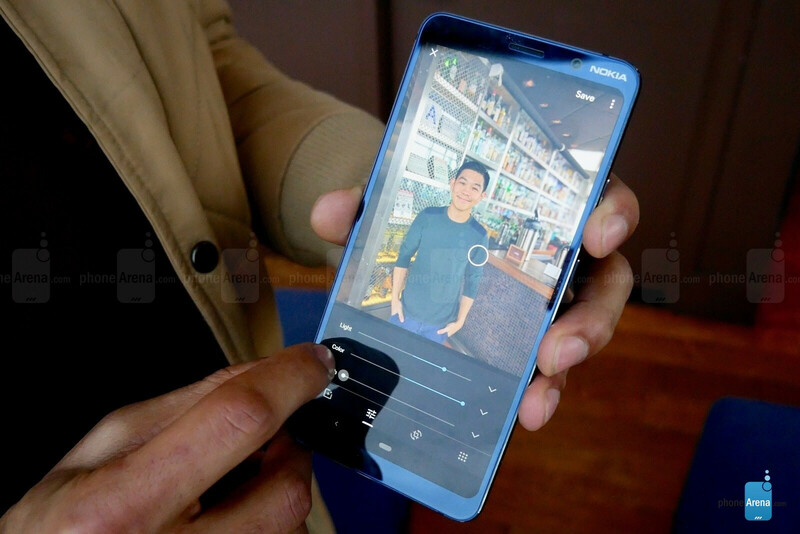 Nokia 9 PureView Hands-On: A cutting-edge Nokia flagship headed to The States! 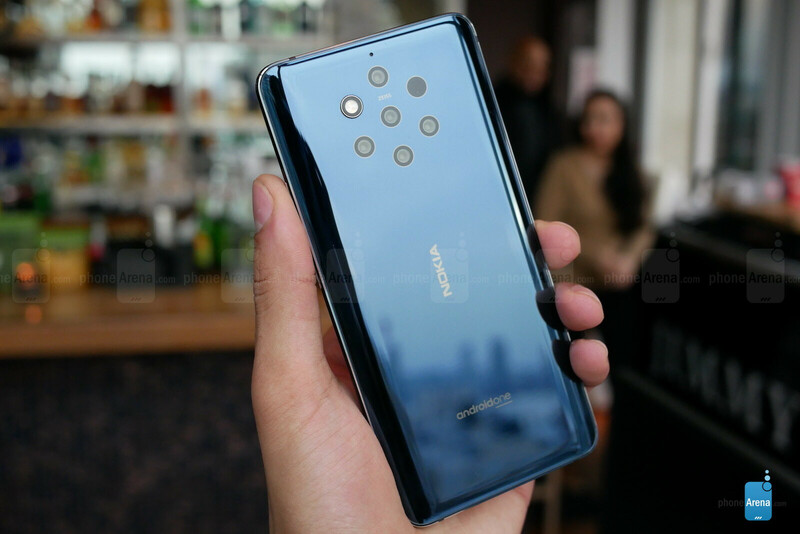 The Nokia 9 PureView is official and it’s coming to the U.S. – the first flagship from the HMD Global-backed Nokia brand to do so! You’ve seen the leaks, you’ve heard the rumors, and yes – the five cameras are a reality, but they work unlike any multi-camera implementations you’ve seen on phones before. It seems HMD wanted to make sure Nokia’s flagship re-introduction to the states was an intriguing one. And that it is, for more reasons than one – and more reasons than the five, too. In fact, we can think of $699 reasons why. No, the back isn’t triggering our Trypophobia – quite the opposite, in fact. As we’ve come to expect from Nokia, it’s a beautiful design, constructed of aluminum and glass with a shimmery, metallic navy-blue back and shiny, silver aluminum accents around the edges. 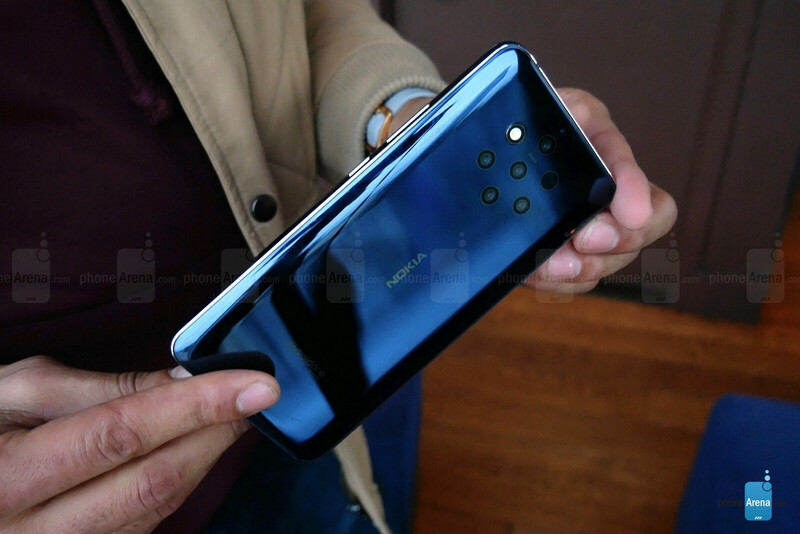 In back, the five-camera array actually looks pretty cool; the sheer number of them gives the Nokia 9 a seriously high-tech look about it, while the flush mounting of all this optical hardware flows seamlessly with the design. The face isn’t all screen – there is a forehead and a chin, as well as some bezel-shaving it could do on the sides – but this 5.99-inch, Quad HD+, P-OLED, “PureView” display looks to have sharp details and accurate colors from our early impressions. We’ll have to see how well its luminosity adapts with more time and varied scenarios, though. 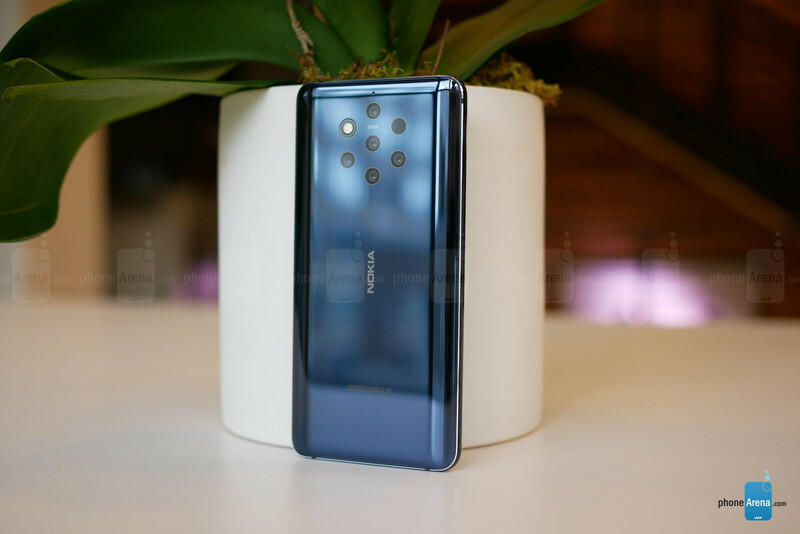 Underneath the screen lies an optical fingerprint scanner, but AI-driven facial unlocking is also possible with the Nokia 9’s 20 MP front-facing camera. Topping things off is an IP67 water and dust resistance rating and Qi Wireless Charging for its 3320 mAh battery. Images captured can contain between 60 and 240 Megapixels of data. 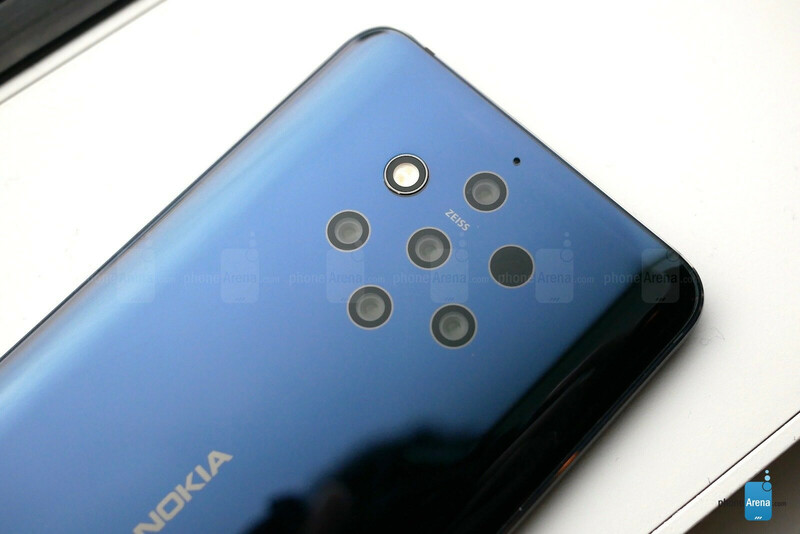 The goal of the Nokia 9’s quintuple cameras isn’t to give a variety of lenses for different shots, as we’ve seen on triple-camera implementations with the Samsung Galaxy S10, LG V40, and Huawei Mate 20. Instead, HMD’s goal is to capture as much information as possible, from all five cameras at once, to compose one hyper-detailed, data-rich photo. In this setup, we’re looking at three 12 MP monochrome cameras paired with two 12 MP RGB cams. These monochrome cameras can capture about 2.9 times more light, HMD says. All together, photos taken from this configuration will have about 10 times more light information than a single regular camera – something we really hope to see the benefits of in low light. Each of the five cameras automatically and independently adjust exposure, focus, and dynamic range on each sensor, doing so in impressively quick fashion. The company worked closely with Qualcomm, and computational imaging company Light to get these five cameras working together seamlessly, enlisting Light to implement their proprietary Lux capacitor chip into Qualcomm’s Snapdragon 845 processor. This is what enables the SD845 to control and process information from the five separate cameras, and do so in an instant. Snapping photos from the Nokia 9 didn’t appear to show any lag beyond any other flagship shooters we’ve tested; however, it seems the image processing happens after the fact, and this can take some time – especially with portrait mode shots. Speaking of which, HMD is boasting up to 1,200 layers of depth in the Nokia 9’s bokeh mode, and the difference can be plainly seen, and manipulated, in Google Photos. A comparison shown to us from some unnamed, top-flight phone cameras showed untouched photos, taken in their device’s respective portrait modes, where the evidence of a more accurate, layered, gradually-applied bokeh effect is objectively seen on the Nokia 9. Color reproduction may be more subjective though; the Nokia 9 wasn’t our favorite in this aspect, but these are very early and limited impressions. The richer depth information also affords users more tweaking in Google Photos, as well as an alternative focus selection after the fact. Naturally, we’re chomping at the bit to put the Nokia 9 through our own photographic paces and see for ourselves how reliably these cameras can produce well-lit, detailed, and accurate photos which, most importantly, can make all our friends jealous. Of course, with all that image data you may be wondering about storage. The Nokia 9 will save 12 MP JPEGs as well as RAW, DNG formats on the phone. Google Photos’ free, unlimited cloud storage will upload JPEGs, and while the DNG formats can save to the cloud as well, those will count against your storage limit. HMD chose the DNG format on purpose, as it’s Adobe’s proprietary image standard – another company which had some collaboration on the Nokia 9. 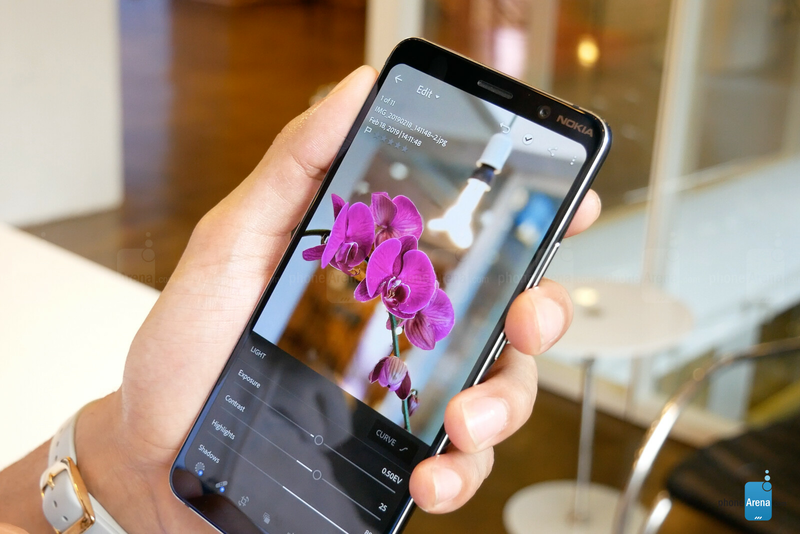 In this case, that means that the Lightroom app for Android has been specifically tailored to get the most control of the unique photo information – what’s called a lens profile – for the imagery produced by the Nokia 9’s five cameras. The Lightroom app won’t be pre-installed, but it will be offered during initial setup on the device. Coming to the USA – for $699! We can’t express how relieved we are to hear this price announced – we only wish it were compatible with all carriers. Sure, you still have the OnePlus 6T undercutting that price by about $100, but who else? Not many, and certainly none with penta-cameras working as one and Nokia’s clean, well-supported Android versions. It’s not a perfect setup, though. As you might’ve read earlier, due to the chip-specific work needed to achieve the five-camera setup, it’s still running last year’s Snapdragon 845 flagship SoC. And while 128 GB starting storage (with 6 GB RAM) is a solid offering, it would be nice to have a MicroSD card slot especially considering that RAW image captures on the device hover around the 30 MB mark. 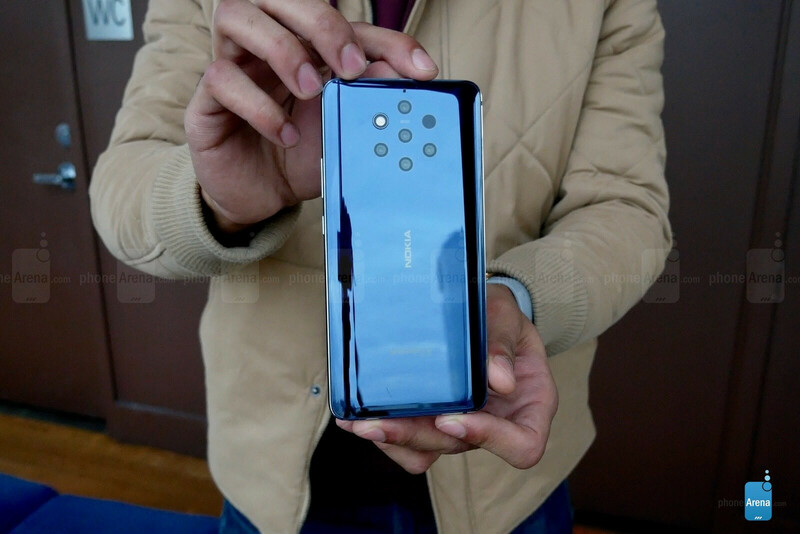 Still, the Nokia 9 is quite the effort from HMD Global and is once again putting Nokia’s name on people’s lips in the U.S. market, along with “flagship”, “cutting edge”, and “less expensive.” All terms which fans and critics alike are excited to hear. LG G6 with 5 cameras. Nice. The battery capacity.... And no mention of video recording capabilities so I'll have to wait and see with this one. I was hoping for larger, around 4000mAh or more. I hope it’s well optimized. Agree. I don't mind paying for a year-old soc, sd845 is great, but having no sd card expansion and have at least 3,500mah battery? I hope nokia can still change their specs for nokia 9, releasing a 9s series in 6 months or something like that. $699 is a good price. Glad it's coming to the US. Nokia 9 vs. Galaxy s10e vs. Pixel 3. I don't care if they don't have the same soc and price, their camera comparison should be very interesting. No Band 71... No band 12.... That's a big DOH! kinda disappointed, tbh. Was hoping some of those cameras would be zoom or wide angle, not a bunch of monochromes. If bokeh is your primary interest, then I guess this is the phone for you...but Iooks like I definitely will be going for the P30 now. I think 9 pureview focus on photo quality, the detail, dynamic range, night shooting etc. Not in versatility. Trash. No wide-angle lens, telephoto, no OIS. "Cameraphone"
I can ditch telephoto lens anytime. Let's be honest here, you don't spend lots of time adjusting your background blur just for social media uploads. Trash? Don't even bother looking at the demo they just showed in the video.lol The images are freaking impressive. Sd845 for $700 is a little too much imo. So much for those claims that HMD wouldn’t release this in the U.S., lol. Anyway, Take. My. Money! The photos shot with the Nokia 9 Pureview were stunning, and I am pleasantly surprised by the co-imaging processor and other efforts that went into the N9PV’s 5 camera setup. This phone is gorgeous! And the $699 price tag, while I would have preferred the $599 price tag, isn’t bad at all for what we are getting. I’m a bit disappointed by the battery capacity, though. I was hoping for 4000mAh or better, but I’m hoping that it’s well optimized. We also now know that the 845 chipset was needed due to achieve the 5 camera setup, and it isn’t a bad chipset by any means. Can’t wait to see full reviews of this! So far, great job, HMD! This was definitely worth the wait. Picking it up as soon as it goes on sale. It's amazing that Nokia has finally justified that backside, but unfortunately I don't think the Pureview is for me. I won't be copping that jawn. Kudos to Nokia for finally getting the US market some much needed attention. I think the Pureview is going to be a phone that will turn a few heads especially with the price compared to the overpriced flagship phones. The penta lense setup was always justified. It’s innovation, and technology moves ever forward. HMD has also been giving the U.S. attention since before the launch of the Nokia 9 Pureview, with it launching smartphones on three North American carriers, and smartphones that were already available in U.S. outlets. I’m definitely copping this jawn even though it’s not “universally unlocked”, as it supports the future proof GSM networks. 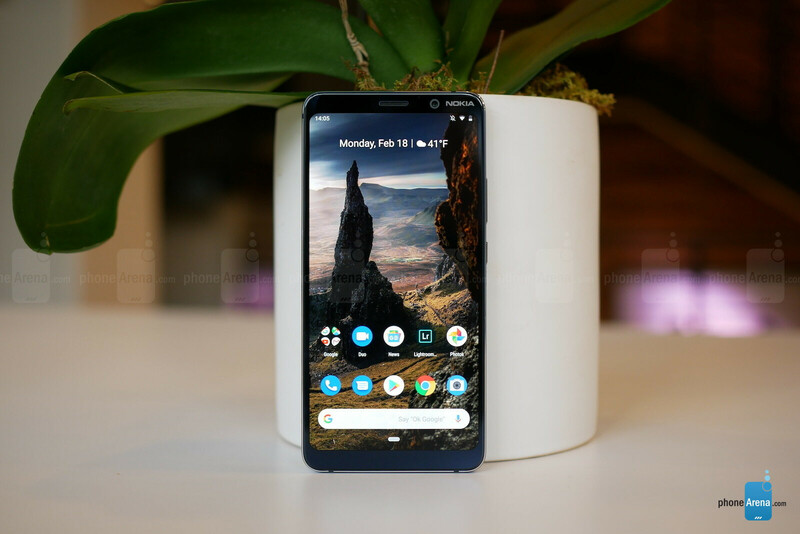 The launch price its at is what the beta testing Google Pixel 3/3XL should have launched at, if not less. Lol what the heck is your problem? No one said anything about universally unlocked or GSM networks. What are you getting so defensive about? I just gave props to the Pureview and complimented that it should definitely turn some heads with the price compared to the overpriced flagship phones. I just said that it's not for me, so get over it. Lol you're grasping at straws so much that you are deflecting by bringing up the Pixel phones. Lmao so who said anything about anyone saying something about “universally unlocked” or “GSM networks”? What’s YOUR problem? Why are you making something out of nothing? Why are you being so dramatic and defensive over my response? I didn’t attack your comment, so stop being so dramatic and get over it. What I said about the Pixels was spot on and my OPINION on the matter. Stop attacking me because of it. You responded to me. Don't try to deflect. I just said that I wasn't going to get the Pureview and you got in your feelings about it going on about universally unlocked phones and a bunch of other things that are irrelevant to the discussion. Lmao I never claimed I didn’t respond to you. Don’t try and change the facts to suit your false narrative. I didn’t attack your comment, I just gave my opinion about the Nokia 9 Pureview vs a smartphone running a similar version of Android. I don’t know why YOU got in your feelings about me mentioning universally unlocked, but nothing I said was irreverent to any conversation. You’re grasping at straws trying to pick a fight.